London, Nov 2 (IANS) — The stamp is available in post offices across Britain. This correspondent purchased several of the stamps Wednesday. The stamp is priced 68 pence, which is the basic charge for sending letters to India. Ramesh Kallidai, general secretary of the Hindu Forum told IANS several Hindu organisations across Britain are organising novel forms of protest after Royal Mail refused to withdraw the stamp. In the image, a man has a ’tilak’ on his forehead clearly identifying him as a Vaishnava Hindu and a woman has the traditional ‘kumkum’ mark on her forehead, identifying her as a married Hindu lady. “It has now caused even greater resentment since Royal Mail had not even originally consulted us before the stamp was issued. We could easily have offered them advice on a suitable depiction of the Mother and Child image that would not have offended anybody,” Kallisai said. “They have shown utter disregard for the issue of evangelical conversions in India,” explained Jo Thanki, president of the Hindu Council of Birmingham. 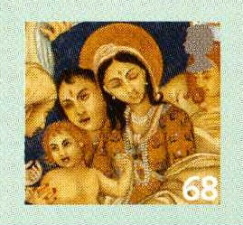 Kishore Ruparelia, general secretary of the Vishwa Hindu Parishad (Britain and Europe), said: “We strongly object to the stamp depicting a Hindu couple worshiping Baby Christ. We are followers of a culture that respects all religious and beliefs but this type of depiction is denigrating and undermines our religious sentiments. “We strongly advise Royal Mail to withdraw this stamp. Otherwise we intend to bring out a mass demonstration to protest about it. This is a deliberate attempt to dilute the thinking of ordinary Hindus,” Ruparelia said. Among the plans are mass mailing of letters without stamps to Royal Mail headquarters to clog the post office at Old Street here, letters of protest by email to Royal Mail and the Department of Trade and Industry, and lobbying with MPs. If Royal Mail continues its refusal to withdraw the stamp, a mass protest outside its headquarters in London is also being planned. “We cannot accept the Royal Mail argument that the stamps have been distributed and cannot be recalled,” said Ratilal Chohan, general secretary of the Hindu Council of the North. A Royal Mail spokesperson confirmed on BBC Wednesday that it had consulted the museum in Mumbai where the painting depicted in the stamp hangs, but could have done more to consult Hindus widely. Hindu leaders identified that Royal Mail had the necessary information technology and resources to withdraw the stamp but did not seem willing to use it. “Royal Mail have appropriate distributed systems software to send a message to every post office counter, asking them to stop sale of the stamp,” explained Venilal Vaghela, chair of the Hindu Council of Brent. The Hindu Forum has asked people not to buy the “offensive stamp”, and to insist on another stamp of similar denomination.